I've kept freshwater tanks for years, starting off with guppies and tetras, progressing to cichlids and finally planted aquariums. Then reef bug has hit me hard and Im on my 3rd reef by now, with a 4th one in the works. I have always been fascinated with aquatic life and when it comes to saltwater, there's an abundance of various life forms. 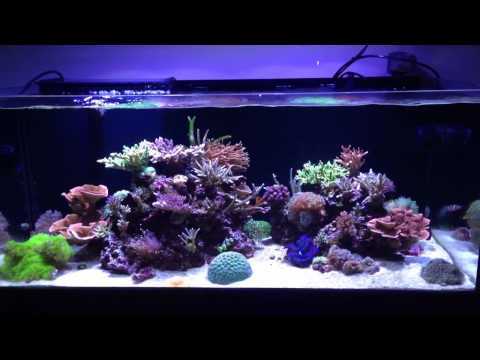 I consider reef keeping to be the ultimate hobby, there's so many aspects to it: biology, chemistry, physics, electronics, carpentry, plumbing. All of this skills are ever evolving and are useful in other parts of life. Most importantly, there's no ceiling to this knowledge, many aquarists with 30 years of experience are still learning. This being my 3rd reef aquarium I went with what seemed back than the largest aquarium I could get - a hundred gallons. 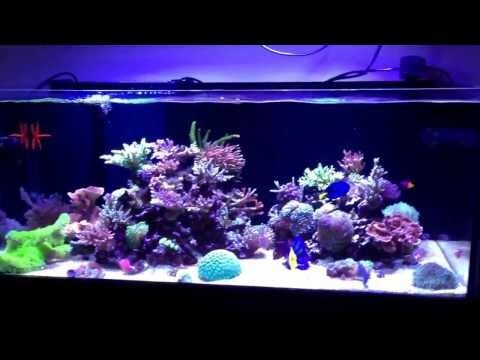 While it seemed overwhelming back then, now the tank looks quite small and I am severely running out of space for both corals and fish. I went with the largest sump I could fit with a huge refugium section, to which I attribute my success. The tank and stand was ordered from Miracles Aquariums, a Canadian company. Everything came on time and the quality is simply superb. While originally this was a stand-alone tank, I've plumbed an external refugium into and have been running them in tandem in the past few months. Large refugium with live rock and chaeto algae is my primary source of biological filtration. I dose ProdiBio complex on a bi-weekly basis and use passive ROX carbon filtration. The tank is lit with 2 EcoTech Radion Pro LEDs. Surprisingly it turned out to be more than enough for this tank and I'm running them at 65% intensity. I've recently upgraded the lenses on those fixtures to wide-angle and am really pleased with the results. 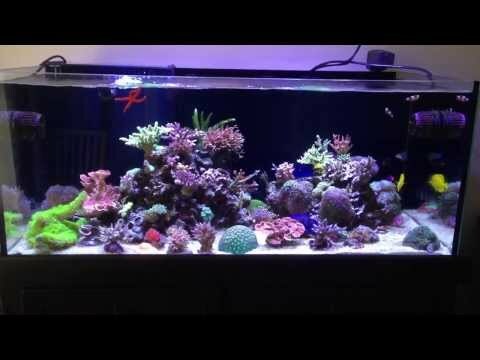 Flow is achieved with 2 EcoTech MP40s on the opposite sides of the reef. They are hooked up to my Apex via WMX module and I cycle through multiple schedules throughout the day. I especially like the Nutrient mode. Return pump is performed by a Waveline 5000 DC Pump which I can highly recommend. I got 3 tangs in my aquarium: Blue Hippo Tang, Yellow Tang and Kole Tang. All three are my favourites and I definitely have a soft spot for tangs. Currently there's only one wrasse (Melanurus) in the tank and he has grown significantly in the last few months. My other fish include: Royal Gramma, Red Firefish, 4 Dispar Anthias and a single clown. I had a few jumpers and will be looking for a screen at some point in the future. Tooth Coral / Galaxea spp. Thick Finger Leather Coral Sinularia spp. I check Alkalinity once or twice a week. Phosphates and Nitrates are checked every 2-3 weeks. The rest are checked once a month or ever rarer. Originally I was targeting Alkalinity at 7 dKh, but lately I've been trying to increase it to 8-9 dKh range. My Salinity, ORP, pH and Temperature are hooked up to my Apex controller. I primarily dose ProdiBio for nitrate control. Supplement it with ZeoBak once in a while plus a bit of amino acids. Currently I dose a 2 part B-Ionic solution by ESV. I plan to supplement this with Kalk in the near future. Every week I perform a 10-15% water change, empty the skimmer cup, replace filter floss and thoroughly clean the glass. On average you perform a 6.8% water change every 7 days. Had a 2.5 hour power outage at night. I think my Vortech was on, but now my skimmer is going crazy. Bought a second ocellaris clown from Hubert, this one is trained for Rose Bubbletip Anemone and went right into it. The other clown is scared to go in but I hope this will change soon. And here's another video update. Winterfell Reef is now 1 year and 1 month old. Got the new Wide Angle TIR lenses for my Radions. Wow, what a difference! Fragged a bunch of corals.. what a joy. My goal is to create a complexly balanced eco system that would provide a healthy environment for my fish and corals to live in. Create a vibrant and diverse mini-universe and try to recreate natural habitat. Feather Duster / Sabellastarte sp. Patience is definitely one of the most important aspects of this hobby and I still need to work on it. I enjoy interacting with other hobbyist and find that visiting someone else's aquarium can be extremely rewarding and informative. The variety of ways to keep a successful reef does not seize to amaze me. I had a number of setbacks, but nothing major, thank God. The biggest disaster I've had up to date was to lose all of my fish to velvet when my tank was 5 months old. That was very painful and it was almost as painful to look at a fish less reef aquarium for another 2 months. There you go - patience. I am now trying to have a stricter quarantine regimen but still don't do it 100 per cent. I would like to thank many members of my local reef club - MAST (Marine Aquarium Society of Toronto) for their various help and also sharing their knowledge with me. 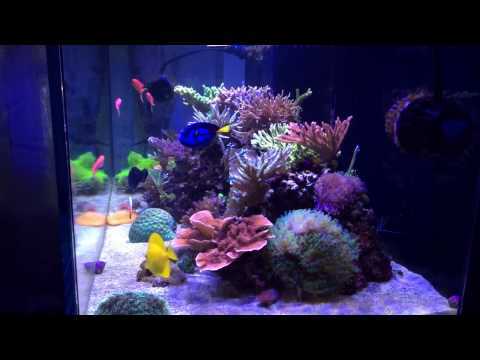 Reef forums such as Reef Central, Reef 2 Reef, Nano-Reef and GTA Aquaria have all been extremely helpful. I also want to thank the following AquaticLog users for their help, support and advice: d2mini, urbaneks, stevek.